All of the records noted below are in response for subpoenaed documents for the year 2005 and the three preceeding years. 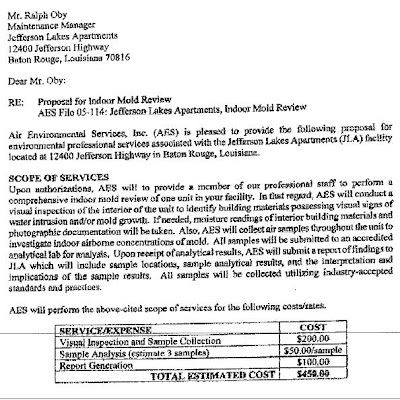 As evidenced, there was testing for mold in apartments in the complex in the year 2007. However, the information requested and regarding testing in 2005 and the prior years before the apartment was leased to us, was never answered or evidenced in response of the subpeoned documents. 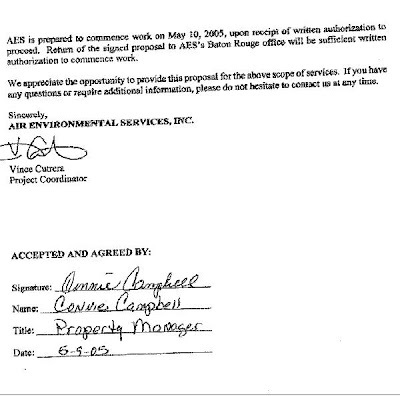 The below documents show Guarantee Service Team of Professionals were cleaning out air ducts & dryer vents. Air Environmental was the testing company management used to test our apartment & used again when the complex was sold in 2007. ODDLY, BOTH SENT RECORDS FOR THE WRONG YEARS. WITH REGARD TO STATMENTS THAT NO PRIOR TESTING FOR MOLD HAD BEEN PERFORMED IN 2002 TO 2005, THE IRRELEVANT DOCUMENTATION OF TESTING DONE IN 2007 WAS ACCEPTED, NO QUESTIONS ASKED, BY OUR ATTORNEY. 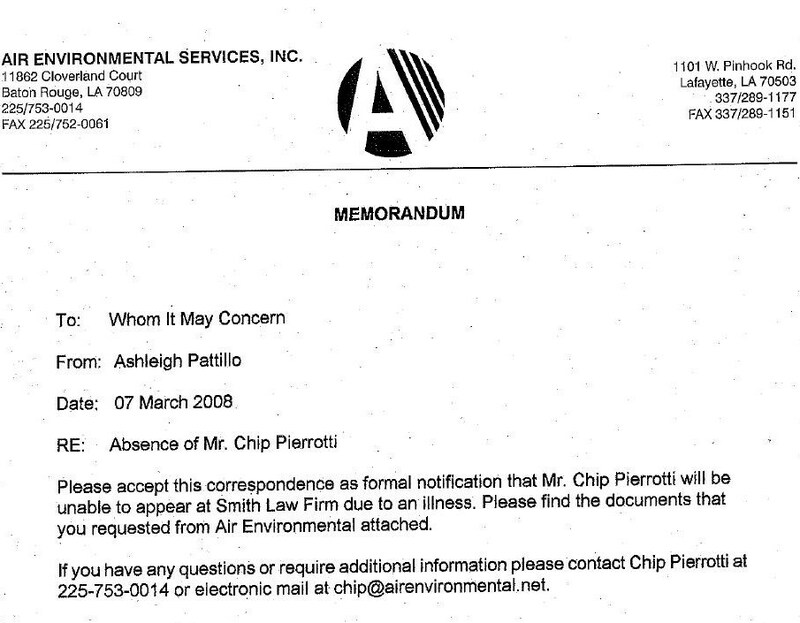 Not only were the wrong records sent by Air Environmental Services, Inc., AGAIN, for testing done years after we were there; Mr. Chip Pierrotti – the registered agent subpoenaed to appear, notified our attorney by letter that he was ill and could not appear. BY NOT APPEARING, OUR ATTORNEY DID NOT HAVE TO ASK THE QUESTION – WHY DID YOU BRING RECORDS FOR 2007 AND NOT 2005 AND THE PRECEEDING 3 YEARS? Mr. Pierrotti’s deposition was never rescheduled to be able to obtain the needed information of what management knew of mold infestations prior to leasing us the apartment. Guarantee Service Team of Professionals sent some invoices for ‘obsessive air duct and dryer vent cleaning’ that included records for 2004 – 2007. AGAIN, THE WRONG YEARS. Records after 2005 were not requested. I do know that another company was used to perfom services of this type like the one in the picture below that I took when we were still in the apartment maybe they thought it would be better if we did not see Guarantee out cleaning vents again. 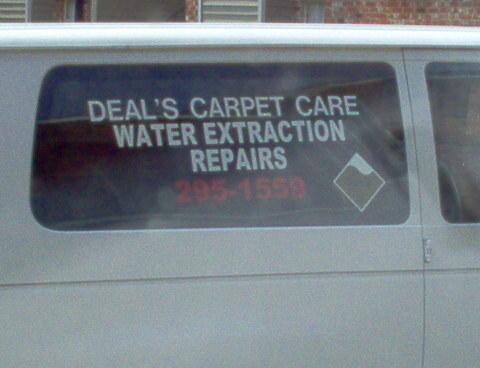 Deal’s also clean ducts. IT IS VERY CLEAR TO ME NO ONE WANTED TO PRODUCE RECORDS FOR 2005 AND THE PRECEEDING 3 YEARS AND VERY CLEAR OUR ATTORNEY, J ARTHUR SMITH III DID NOT WANT TO RECEIVE THEM. Our attorney did not subpoena records for any other mold testing companies. Riverstone Residential sent ‘some’ maintenance records from 1995 – 2005, that show years of leaks in the apartment we were in. They even went an extra step and tossed in maintenance records dated from the time we moved out until six months later. It looks as if they are trying to show that nothing really had to be done to the apartment after we moved out, like VENT CLEANING, etc. Records for the time after we moved out were not in the supeona (not that the correct records were being sent by anyone) but what these records don’t show is that they forgot to include having all the carpet replaced because it was so wet and sticky from all the mold coming from the vents. I drove through the complex and saw the carpet in the parking lot. Perhaps if they forgot to include changing the carpet in the records,perhaps they forgot to include the air vent cleaning that would have had to be done since it had grown so thick in the four months we were there. …from the failure to proffer necessary documents. It is well known that the opponent to a summary judgment motion must offer admissible proof that a question of fact exists. The opponent of a motion to dismiss an auto case for lack of serious physical injury must offer the affidavit of a physician, and that affidavit must set forth some objective proofs of the injury. 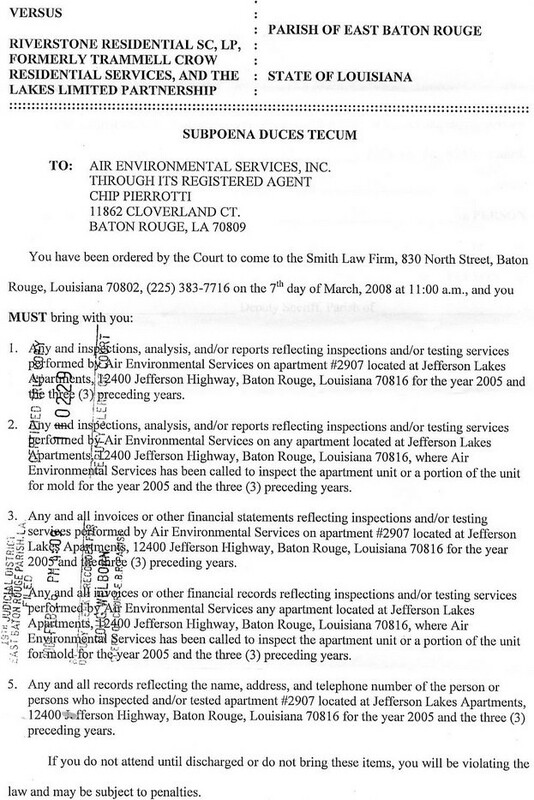 They will dismiss a pending reconventional demand for rent, plus costs, interest, and attorney fees if we agree would agree, in writing, to not pursue a writ with the Louisiana Supreme Court OR take any further action to pursue litigation against Jefferson Lakes Apartments, its owners, agents, or representatives. Maybe they were hoping all the toxin producing molds we were exposed to in their toxic apartment complex (still leasing) had affected our cognitive abilities and we would sign! They have, but not enough to sign something that stupid. Coming up – the overwhelming evidence that several obvious and illegal measures that were taken to avoid producing past records of mold testing at Jefferson Lakes Apartments before we ever moved in along with records of air duct cleaning in the apartment we leased. Of course, the evidence of water leaks, inferior repairs, and visual mold documented in photos along with our mold inspection report was enough to prove they knew about the mold. Especially since the massive amounts of growth proves it has been growing for a long time. Granting their motion for summary judgement with that evidence looks corrupt but if the records showing past mold testing had been done at the complex because of complaints, that would have been solid evidence the judge could not ignore or overlook and prove that management should have been on notice. The 2007 mold inspection reports that were done two years after we moved out during a sale and sent to me by accident could not be used in court. Those reports sure prove they know about the mold in the complex now while they continue leasing! Amazingly, Riverstone Residential is upset some may actually choose NOT to move into toxic mold infested apartments at Jefferson Lakes after viewing reports & still claiming they did not (and still don’t) know of toxic conditions! Maybe they should read the – mold inspection reports. My report in 2005 shows very high levels of different molds in the apartment we were in but the 2007 report shows mold in MANY apartments. I received that report by accident only because evidence was purposely being withheld and those involved in that illegal activity were not very careful. 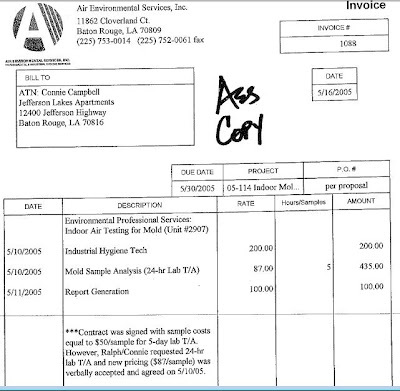 Notice at bottom of the last page – ***Contract was signed with sample costs equal to $50.00/sample for 5 day lab T/A. However, Ralph/Connie requested 24-hour lab T/A and new pricing ($87.00/sample) was verbally accepted and agreed on 5/10/05. A 24 hour air test will usually not show mold – it needs at least 48 hours. Notice they did not opt for the visual inspection and photo documentation because it looked like this – photos of mold in apt – and they knew it. More information will be posted to show they knew (or should have known of these conditions) – my Microbial | Fungal | IAQ Report (and see court documents – Affidavit – Plaintiff’s 2005 Microbial-IAQ-Fungal Report – Envirotest, Inc – Jefferson Lakes Apts), maintenance records showing years of leaks in the apartment, and the unusual amount of duct and dryer vent cleanings. Our unethical attorney subpoenaed records from the testing company management used (also the same company that did the testing for units in the complex in 2007) for 3 years previous to the time we were there but records for after that time were sent and this was not corrected. The fact that this was not the only action on his part to NOT get evidence (see – court documents – Plaintiff’s Attorney Subpoenas wrong Company – No Evidence and Riverstone Residential’s Motion for Summary Judgment – Judge Timothy Kelly – 19th Judicial Court – Baton Rouge, LA) makes it seem there could be other testing done by this company before we were there especially since the employee that did the testing told me he had been to this complex before. He also took a piece of the wet ceiling and told the maintenance man that there was mold (although this was not the beginning of mold growth – it had been spreading for years). Unfortunately though, records from 2005 and after included the shocking 2007 reports! More to come on the unethical actions by our attorney which are affecting our rights to justice in court. And now Riverstone Residential is claiming I am harming THEM! I am posting DOCUMENTED FACTS and they are trying to get away with poisoning us and others and are UPSET that some may choose not to be exposed to toxins! They forgot to include mold testing reports in their actions seeking to prevent me from posting this information. I wish we had known about the EXTENSIVE mold growth in these apartments before we spent four horrible months there. We would have passed. The high doses of toxins will affect our health for the rest of our lives.